A lock which has a dead bolt only. The lock shown in the image below is a mortice deadlock. The lock body is morticed into the leading edge of the door and a key hole is cut into the face of the door on either side to line up with the key hole in the lock body. When they key is turned, the dead bolt is thrown locking the door. A mortice deadlock is typically used in conjunction with a rim nightlatch. A mortice deadlock does not have a latch function and so cannot be operated by door handles. Because of this there is no way of pulling the door open and closed or even for the door to remain closed without being locked with the key. 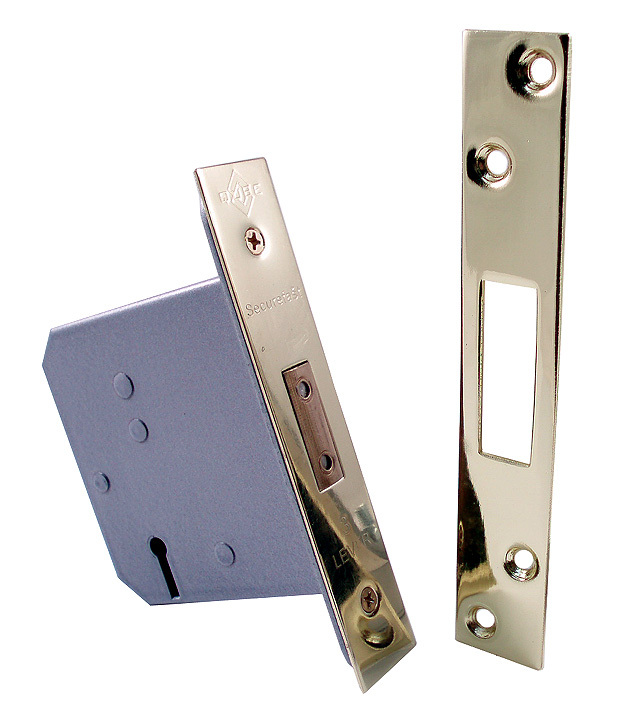 A nightlatch allows the door to close on the latch and has a small handle for pulling the door closed. There are different security levels and sizes available when choosing a dead lock. If the lock is being fitted internally then a 3 lever deadlock would usually be sufficient. If the deadlock is to be fitted to an exterior door then a British Standard 5 lever deadlock would be a better security option. If replacing a lock it is also important to check the lock size, in particular the backset measurement. This is the distance from the face plate to the centre of the key hole. The new lock dimensions should match up to the old as close as possible to avoid having to alter the door.